The interchange is a collection of TEN turnouts controlled by the route control system in the main panel. Seven of them can be seen in the photo. It is basically a scissors crossover between the inner and outer lines. A passing siding and a branch to the upper line are integrated into the interchange such that a train can pass between any two lines without fouling the third line. The route control system sets all 10 turnouts correctly depending on which of 6 routes are selected and also establishes correct power routing through the interchange. 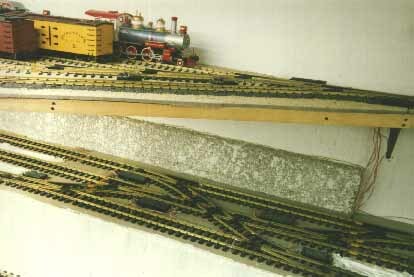 The passing siding also allows cars to be left at the bottom of the spiral while doubling the grade, a common requirement since the spiral is 5.2%.